Investigates mechanisms of immune activity and tolerance in intestinal mucosa. At the surface of the intestinal lining, immune responses are carefully balanced: Invasive pathogens must be eliminated or excluded, while nutrients and trillions of commensal microbes must be tolerated. Mucida studies how the immune system associated with intestinal mucosae maintains this careful balance by generating efficient protective responses without jeopardizing its tolerance to innocuous foreign substances. The human intestinal mucosae, with an area of about 300 square meters, form the largest body surface exposed to the outside world. Within the gut, an estimated 10 trillion commensal bacteria reside, and each day, about 100 grams of dietary protein passes through. Although the great majority of these potential antigens are harmless, the intestine is a major entry point for viruses, pathogenic bacteria, fungi, and parasites. To mediate immunity over such a large and active area, the intestine contains more lymphocytes than the entire rest of the human body. These cells must act rapidly and efficiently to protect the gut, while also avoiding unregulated or excessive immune responses that potentially could lead to allergies and severe inflammatory bowel diseases. In a healthy gut, the immune system strikes a perfect balance between responsiveness and tolerance. Mucida studies the mechanisms behind these two competing immunological functions within intestinal tissue, and what happens when either is compromised. 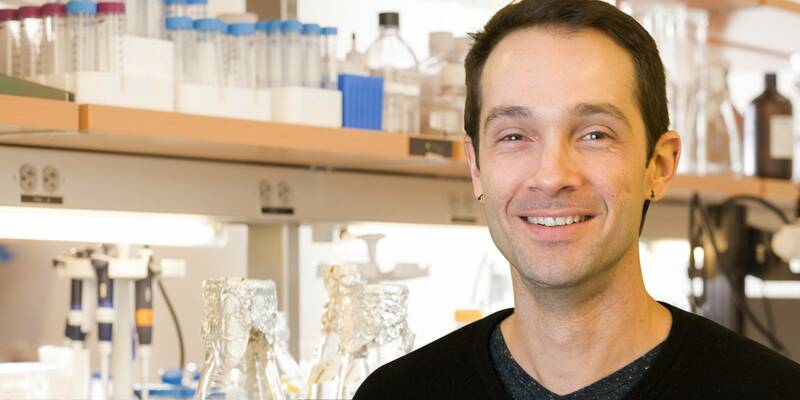 His lab is testing the hypothesis that distinct signals from lymphocytes’ spatial niches within intestinal tissue determine these cells’ pro- or anti-inflammatory activity. Currently, the nature of such environmental cues and the mechanisms by which they influence immune cells’ adaptation are not well understood. A major focus of the lab is the development and function of leukocytes that are stimulated by antigens and other cues from the surrounding intestinal tissue. These include intraepithelial lymphocytes (IELs), a class of specialized T cells found within and just below the intestinal epithelium. Mucida’s work has shown that the presence of TGF-β, retinoic acid, and microbiota can induce CD4 T cell plasticity, leading, for instance, Foxp3-expressing regulatory T cells (Tregs) to differentiate into tolerance-promoting IELs. His ongoing work continues to define how IELs contribute to the immunological balance within the gut, including their role in protecting against infection. Located within the intestinal muscularis, neurons that innervate the gut’s lining also send signals to gut immune cells, and Mucida’s lab is investigating the hypothesis that the enteric neurons may provide a means to quickly sync immune responses across a large area. A recent study from the lab found that, in a luminal infection, norepinephrine from sympathetic neurons activates a tissue-protective gene program in muscularis macrophages. Mucida continues to study how such neuro-immune communication might help control inflammation, and how its loss can lead to severe tissue damage and inflammatory disorders. Cues from within the intestinal lumen can also affect tolerance of innocuous antigens throughout the body. Mucida is working to better understand the mechanisms behind this phenomenon, known as oral tolerance. His lab has determined that only classical dendritic cells are required to generate the tolerance-inducing peripheral Tregs necessary for oral tolerance, and he is now further investigating the means by which signals derived from the intestinal lumen are disseminated. Hoytema van Konijnenburg, D.P. et al. Intestinal epithelial and intraepithelial T cell crosstalk mediates a dynamic response to infection. Cell 171, 783–794 (2017). Esterházy, D. et al. Classical dendritic cells are required for dietary antigen-mediated induction of peripheral Treg cells and tolerance. Nat. Immunol. 17, 545–555 (2016). Pedicord, V.A. et al. Exploiting a host-commensal interaction to promote intestinal barrier function and enteric pathogen tolerance. Sci Immunol 1, eaai7732 (2016).